I recently delivered the closing keynote at the Social Fresh Conference in Orlando (the next Social Fresh – a conference I very much endorse – is in October in San Diego). My presentation was called “Shotguns Trump Rifles: Why Social Success is Now a Volume Play” and was one of most controversial talks I’ve ever given about social media strategy. I’ve embedded the slides and video below, and I do hope you’ll spend a few minutes now (or download for later) because this issue impacts every single person using social media strategy for business. Social media offers your brand reach, but today’s social media is terrible at reliable reach. Reliable reach is the ability to send a message to a person who has asked to hear from you, and for that message to reach that person. Email has reliable reach. So does direct mail. And the telephone. And even fax. Social media does not have reliable reach, which is what makes it so challenging for marketers. Reliable reach is the ability to send a message to a person who has asked to hear from you, and for that message to reach that person. If I send out a tweet, the 124,000 who have said they want to hear from me won’t see that tweet. A small cross-section (usually about 2,000, according to my Twitter stats) will see it instead. Thus, my theoretical reach is 124,000, but my reliable reach is about 1.6% of that, and the actual people comprising that 1.6% shifts somewhat from tweet to tweet. The same dynamics exist on Linkedin, Pinterest, Instagram, Google +, and especially Facebook. So while social media consultants, agencies, and in-house social marketers looking to impress their bosses often run reports that cite impressions figures for social media, those numbers are usually potential impressions (theoretical reach) not actual impressions (reliable reach). 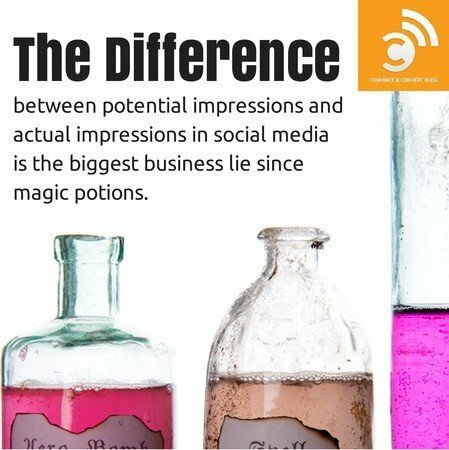 And the difference between potential impressions and actual impressions in social media is the biggest business lie since magic potions. What this lack of reliable reach means is that we keep trying to communicate with people who have asked to hear from us, but when we send those messages what we mostly get are busy signals. This is partially because of the incredible competition for attention that is inherent in social media. Realize that all of the major social media platforms in North America rely on a one-to-many architecture that satiates the presumed desire for everyone to be a publisher. The concept that we want our missives to be seen by as many people as possible is the psychological engine for all of these social networks. It’s why it’s relatively difficult to set up lists and groups to be able to send messages to just a few people. In the everyone is a publisher world, the communications cacophony is simply staggering. Facebook has said that on average, each user is “due” 1500 pieces of content every time they log in. And your brand messages are lumped into that 1500. That’s a tough success equation, because NOBODY says that their favorite part of social media is brands participating in it. Your brand is tolerated in social media because it keeps it free for the rest of us. And of course, social networks are (except for Pinterest) public companies. This means they have a legal responsibility to maximize THEIR success, not yours. Consequently, you see reliable reach getting squeezed even more so than the mathematics of competition alone would indicate. As long as brands are willing to pay for reliable reach (and Facebook’s recent announcement of a 61% increase in ads year-over-year suggests that we are very much willing), organic reliable reach will continue to diminish. And by the way, if you think that the exact same Reachpocalypse that we’ve seen with Facebook won’t eventually happen with Instagram and Pinterest, you’re kidding yourself. Prepare for it. So what should you do? What should I do? What’s the plan when reliable reach is slipping away, and shows no signs of returning? I believe it’s time to set aside the rifle, and grab the shotgun. But the problem with the rifle approach is that it’s a rulebook that needs reliable reach to be valid. But today’s social media truths for business mean that the rifle approach isn’t necessarily the best practice any longer. 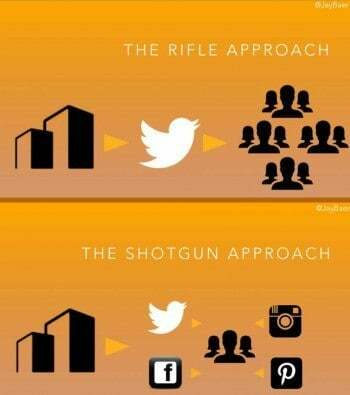 The shotgun approach is a new way of conducting your social media affairs, based on the mathematical realities of an era where reliable reach has gone unicorn. You need to be sending more messages in more places. The total potential size of a social network is far less relevant than the number of people you ACTUALLY reach there. Because such a small percentage of your total audience will see any one message you send in any particular venue, you can adopt an editorial calendar that works across-the-board, with changes in execution to fit each network’s norms. In the shotgun approach, you don’t worry as much about building a big audience in any particular network, but instead building a touchpoint corral around each of your customers and fans. The holy grail isn’t one million Facebook fans, but being connected to each of your fans in as many places as possible. The more places you are connected to your customers and fans, the more places you have permission to contact them, the greater the chances that you will actually be able to contact them somehow, somewhere. The shotgun approach emphasizes different metrics, too. Instead of worrying about fan count or engagement in each venue, measure total brand connections across all venues. The best possible metric for the shotgun approach is average number of connections per fan. If you follow me on Twitter, we are connected in one place. If you follow me on Twitter, subscribe to this blog via email, and have me in a G+ circle, we are connected in three places. This is the touch point corral. Moving every one of your fans from one to three (or more) is the strategic thrust of the shotgun approach. My friend Jeff Rohrs (co-host of the Social Pros podcast) has an excellent book called Audience that goes in-depth on this concept. I understand that the shotgun approach may seem odd. It feels weird, even to me, and I came up with it. It puts a premium on quantity, which is the opposite of what most people in social media have been preaching for five years. I wish reliable reach wasn’t like finding a needle in a haystack, and I wish the solution wasn’t to build more haystacks, which is essentially what the shotgun approach recommends. But realistically, when you look at the numbers, I very much believe it’s time to consider embracing this approach, which incidentally is good news for social media professionals since more labor is needed to execute this playbook.